Details relating to the Finnish Commemorative of 2012. 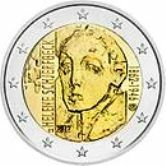 The coin commemorates the 150th anniversary of the birth of Helene Schjerfbeck. She was a Finnish painter known for her realistic portrait and landscape paintings. The motif for the coin is a stylized self portrait of the artist – this is similar to the image on the 1996 100 Markkaa coin. The name “HELENE SCHJERBECK” is shown in large script running vertically from seven to eleven o’clock. At the bottom of the inscription is the country mark FI and next to that the year of issue 2012. On the extreme right of the inner circle o’clock, running vertically, are the dates of birth and death of the painter – 1862 and 1946. Finally, the mint mark appears at four o’clock. 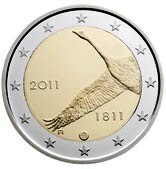 Return from Finnish Commemorative 2012 to euro coin collector.